Many people in Atlanta are turning to Onyx countertops to achieve an exceptional look. Onyx is a form of marble, comprised mostly of calcite. Like other marbles, onyx is much softer than granite. 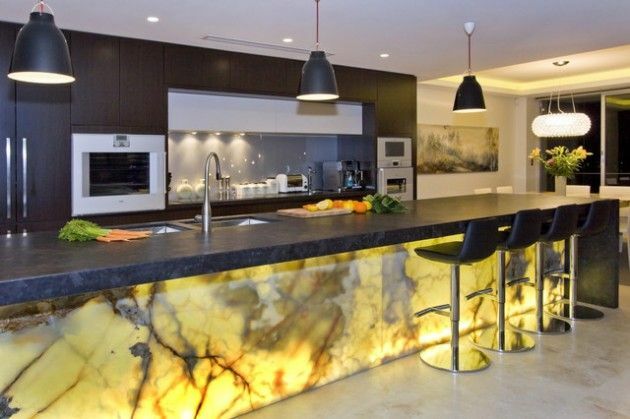 What I like about Onyx is unlike other marbles, onyx is translucent and can be lit from behind to showcase its beauty. Onyx is an extremely variable stone with heavy veining which is something I really appreciate. No two pieces of onyx are ever exactly alike, and one slab might contain dozens of colors. Onyx slabs are not as large as granite slabs are, because the material is much more fragile and unlikely to be extracted in such a large block. One thing to consider is Onyx is a fragile stone. It can be marked easily by knives, pots, cleaning elements and acids. Therefore, onyx should be used in low-traffic areas or low-use areas. Bathroom vanity tops and some bar tops that do not get a lot of use can be complemented by the colors and veins of onyx. Just like with Granite moisture from glasses and foods should be wiped up as quickly as possible to prevent marking the stone. Onyx counters always should be cleaned with a stone cleaner and sealed on a regular basis to impede staining. To speak to an Onyx expert call 404-592-5599 or visit us at natural stone showroom.